Well, as rowdy as a snooker tournament gets. Just as Ronnie was sewing up the match to book his place in the last 16, a pesky pitch/table invader dodged the security and made her way down to the playing area. 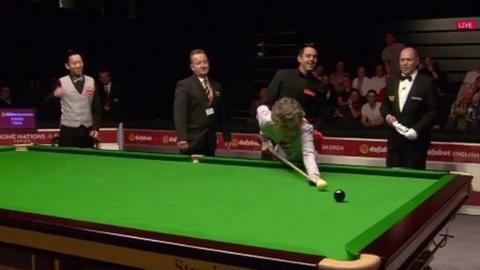 Ronnie, ever the joker, potted the pink and then handed the cue to the woman to attempt to pot what was a relatively easy black. She missed. More practice required.